These pages about Dåseberga is in reality about my hobbies in general and model railroading in particular. An impossible combination at first, but they actually fit quite well together in one way or another. Why Dåseberga? Well, Dåseberga is the a small town at the end of a railroad side line in my model world. It is placed in a laid-back and slightly sleepy 1950´s and 60´s before the demolition rage of the late 60´s and 70´s. 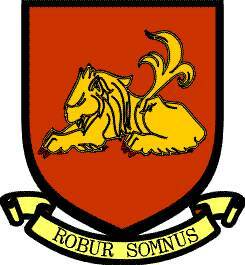 The Dåseberga city Crest is a fantasy crest depicting a sleeping lion on a dark red background with the latin proverb ROBUR SOMNUS meaning sleep gives strength. The common denominator is the modelling where metalwork is one part and gardening another, both providing insigths in machining and environment. The three different parts are then just like facets on a precious stone called creativity (or something like it), and all of this just because it pleases me and gives me a chance to create a story around Dåseberga. Of course I do more than this, but that is part of the everyday activities like job, family, my house and car, and occasionally some renovation work. What is described on these pages is then what happens on the time "left over". Updates of these pages are made as required, but always announced under the News headline to the left. Finally, all copyright to text and images on these pages is mine and only mine. Material is therefore NOT allowed to be copied or published without the written permission from me. So please ask before use. If you have comments or questions about these pages, please use: .